Two of the three remaining unbeaten teams in the Centennial League will square off this week as Junction City travels to Topeka to take on Washburn Rural. Junction City came into the 2015 season with high expectations having returning 10 starters off of a defense that surrendered less than 14 points per game a season ago. The Blue Jays finished 8-3 last season and reached the Class 6A quarterfinals before falling to Lawrence Free State. Thus far this season, the defense has helped Junction City to a 4-0 start. The Blue Jays has surrendered only 28 total points; 14 each in blowout wins over Topeka Highland Park and Emporia. Junction City has posted shutouts its past two games against Shawnee Heights (64-0) and Topeka Seaman (40-0). The offense has played well too. The Blue Jays have scored 211 points and are averaging nearly 53 points per game. Raye Wilson and Jovon Baldwin give the Blue Jays options in the backfield. Wilson rushed for 129 yards and two touchdowns on 17 carries, while Baldwin scored three times as part of his seven-carry, 130-yard night. Quarterback Ryan Henington completed just 5 of 13 passes against Seaman, but for 96 yards. Baldwin caught 2 passes for 49 yards out of the backfield. Washburn Rural has been a surprise to many at starting 4-0. Matthew Williams has been a key component of a Junior Blue offense that is averaging 28 points per game. Williams has 539 rushing yards through four games, while averaging 6.8 yards per carry. Hunter Browning has chipped in 202 rushing yards at a clip of 8.8 yards per attempt. As a team, Washburn Rural is averaging 251 yards per game on the ground and 94 through the air. Junior quarterback Mitchell Schurig, Washburn University Head Coach Craig Shurig’s son, has passed for 377 yards this season. On the defensive side, Rural has stopped opponents’ run game to an average of 85 yards per game. The Junior Blues are giving up only 13 points per game. Longtime Colgan coach Chuck Smith faces his son, Mark, for the third time in the Colgan-Frontenac rivalry. Frontenac is 2-1 versus the Panthers since Mark Smith took over as Raiders’ head coach. Frontenac won in overtime, 26-25 in 2012, while Colgan earned a 26-7 victory in 2013. Frontenac won 14-7 last season. Colgan ranks No. 1 in 64-team Class 3A in scoring defense with 13 points allowed. The Panthers have tallied 127 points this year. Colgan has allowed just 77 rushing yards a contest. Senior Ryan Cedeno has completed 25 of 45 passes for 456 yards with seven scores against no interceptions. The offense has averaged 3.9 rushing yards per carry. The defense has 20 TFLs and forced 10 turnovers. Senior Connor O’Brien has picked off three passes. Colgan lost 7-0 to Galena in the season opener and has permitted just six points since, including back-to-back shutouts. The Raiders have outscored opponents 129-69 with just one returning offensive starter and four defensive starters back. Frontenac lost at Osawatomie, 41-37, in Week 1 and posted wins over Riverton (33-14), Southeast-Cherokee (40-0), and 19-14 at Galena last week. Senior Brandon Mlekus, in his first season as the starting quarterback, has completed 42 of 66 passes for 661 yards with six scores against one interception. Mlekus has 36 carries for 275 yards and four scores. Senior fullback Ryan Menghini has 38 carries for 281 yards and three scores, while Caden Bolinger has 40 carries for 297 yards and three touchdowns. Frontenac has averaged 379 total yards a game with an average score of 32-17. This game is normally close and low-scoring and that will be the case again Friday. Frontenac’s more well-rounded offensive attack earns the win. First place in the Central Plains League is on the line this week when Chaparral visits Garden Plain. The Roadrunners and Owls are the only two remaining unbeaten teams in the CPL after four weeks. Chaparral was a surprise team in 2014 in finishing 9-2 and reaching the second round of the 3A playoffs. Gone from that team are Kpreps All-State selections Jaden Helms off the offensive line, Roger Clark at receiver, and Shrine Bowl selection Shawn Nulik at quarterback. Junior running back Jacob Jenkins has led the Roadrunner offense thus far with 480 yards rushing and 11 touchdowns. Jankins’ classmates Estin Overton and Parker Patterson have contributed 211 and 179 rushing yards, respectively. Patterson has seen some time at quarterback as has sophomore Andrew Clark. Clark has completed 56 percent of his attempts for 251 yards and two scores, while Patterson has thrown for 125 yards and three scores. Senior Adam Clark and junior Sean Reeves lead the defense with 49 and 45 tackles, respectively. Garden Plain is unbeaten having beaten Cheney and Conway Springs. The Owls are averaging nearly 230 yards per game on the ground and spreading the carries around to several different backs. Nate Pauly is Garden Plain’s leading rusher with 262 yards and three scores on just 13 carries. Marty Landwehr, Keynan Wright, and Walter Stuhlsatz have rushed for 190, 151, and 146 yards, respectively. Quarterback Alec Becker has thrown for 322 yards and four touchdowns, and Pauly has been his main target with five receptions for 117 yards and two scores. Chaparral won last year’s meeting 16-6 at home. The teams have played one common opponent thus far in Wichita Independent. 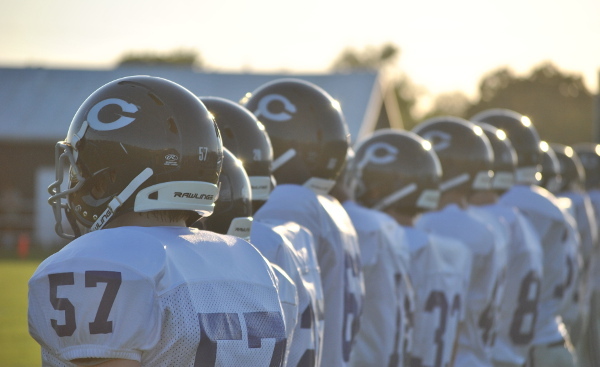 Chaparral beat the Panthers 43-27 back in Week 1, while Garden Plain routed Independent 42-7 last week. The Centralia Panthers will visit the Washington County Tigers on Friday with the 11-man version of Twin Valley League championship on the line. The Panthers had a 28-game TVL winning streak snapped by Troy in Week 2. In that game, Troy led Centralia 30-0 before the Panthers stormed back to take a 34-30 lead. Troy responded with a 35-yard touchdown pass with about three minutes remaining to take a 37-34 lead, and Centralia’s final drive ended in an interception. Still the Panthers have won or shared in the last 16 TVL titles. Centralia continues to do work on the ground under Larry Glatczak. The Panthers have averaged 354 yards per game on the ground and have improved their total rushing yardage each week. Centralia rushed for 409 yards in last week’s 44-15 win over Doniphan West. The Panthers are led by senior John Johnson who has rushed for 766 yards and 11 touchdowns on 83 carries so far this season. raden Deters directs the Panther offense and has rushed for six touchdowns of his own, while passing for three more scores. Washington County can win the TVL title outright with a win over Centralia. The Tigers have cruised through TVL opponents during the first four weeks of the season, including a 36-18 win over Troy in Week 1. Quarterback Konnor Penning is a three-year starter for the Tigers, and passed for nearly 1,200 yards to go along with 12 touchdowns last season. Penning passed for 146 yards and three touchdowns and rushed for two more scores in the Week 1 win over Troy. Cole Thompson has been Penning’s favorite target at receiver. He caught all three Penning touchdown passes against the Trojans. Hunter Kier has emerged as the Tigers primary threat out of the backfield. A win by Washington County would be extra special for first-year Head Coach Doug Thompson, who is a graduate of Centralia. St. Francis has two quality wins and a pair of blowout wins. The Indians opened with a 24-0 victory at Triplains-Brewster, a 3-1 squad that’s 15-7 in the last 22 games. In Week 3, the Indians defeated Oberlin-Decatur Community, 38-34, for a key district victory. St. Francis defeated struggling programs Tribune-Greeley County (64-0) and Quinter (90-0) in Weeks 2 and 4. The Indians went 5-4 last season for its first winning record since a 7-4 season in 2009. St. Francis is 9-4 since switching to the eight-man level. The Indians have enjoyed plenty of track success, especially in the sprints, the last several years, and that has helped an offense average 31.6 points per game in 2014 and 54 per contest this fall. Quinton Cravens has played well at quarterback and Taylor Rogers has emerged in the backfield. In the win versus Oberlin, Cravens found Rogers for a 37-yard TD pass and Rogers rushed for a 27-yard score. Garrett Brunk has been a leader on both sides of the ball. The defense held Oberlin at the Indian 25-yard line in the final seconds. In the last five years, Atwood-Rawlins County has actually been a much better road team (25-19) than at home (20-18). This season, its 1-1 at home with a season-opening loss to powerhouse Sharon Springs-Wallace County and 2-0 on the road. The Buffs have outscored opponents 156-68. Junior Cole Sramek has 41 carries for 348 yards and eight touchdowns. Rawlins County has four players with at least 127 yards. Sophomore Braden Leitner has 398 all-purpose yards, including 255 in defensive/special teams returns. Rawlins County has played the No. 17 strength of schedule in the classification, while St. Francis’ schedule is No. 33. Atwood has won three straight in the series (24-14, 16-8, 44-8), but the Indians won six in a row from 2004-09. The Indians’ overall offensive talent and team speed, yields a close victory.